Twitter Cards - or what I call "Rich Media Tweets"
Twitter cards have been around for quite a while now, yet, uptake in them is a little lacking, especially in small businesses. I was at a meeting yesterday with maybe ten other local businesses and I asked the group who has twitter cards setup. I got dead silence in response. I won’t drop anyone in it, but I know for a fact that one person there does… We set them up for him on his website! Perhaps I didn’t explain them to him properly, perhaps he didn’t understand or maybe he didn’t feel they were relevant to him? I was going to email him today to explain just how useful they are, but since there were a few people at the meeting who sounded interested in hearing more, I decided to write this blog post instead! A standard tweet consists of 140 characters. Add a link and you will lose up to 22 of those characters, add an image and you will lose even more, tag people in that image and more still are lost. #Hashtags cut down on your character real estate too as does @ing people. Sometimes it feels like the character count of one tweet is so prohibitive that is near impossible to get a fraction of the message across. It might surprise you that with very little knowhow, it is in fact possible to get hundreds of characters into a tweet. But not only that; images, image galleries, videos, product and product info/price, and app info can all be included alongside a tweet. “Twitter cards” are the name that Twitter has given to what is more easily understood as “Rich Media Tweets”. The rich media in this case being the photos, videos etc I have mentioned above. They are included in the tweet via means of a link to them on a website. Youtube use the “Video cards“. We make video for our clients and host them on youtube. This is a video we made for Dominic Tunnell Opticians, hosted on youtube. Dom can tweet this anytime he likes and the video of him telling the world about how great his business is appears in all its glory in the twitter timeline. Video cards are especially good as they automatically expand in the timeline. If you have a look at this screen shot you can see how impactful a video card can be. The best thing about these rich tweets, is that once set up on a website, they work for anyone who tweets them. So if someone else tweets a link to your content, if you have twitter cards set up on your site, the tweet will be tweeted as a twitter card. 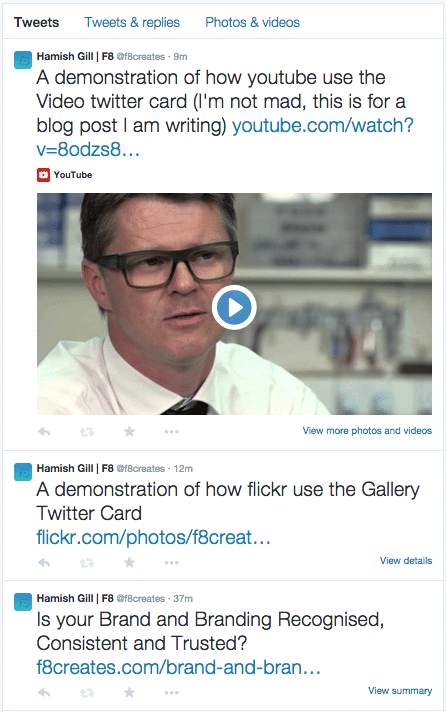 Twitter Cards for your Business? 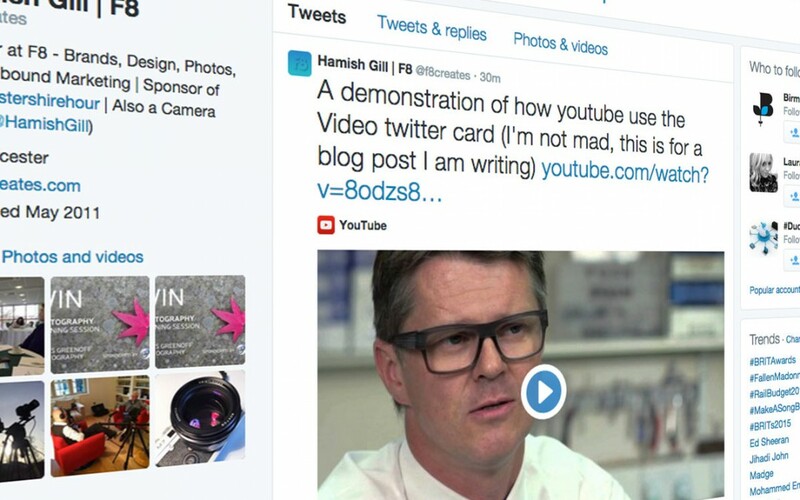 Hopefully that might give you some idea of how twitter cards could be useful for your business. But I imagine the question remains, “How do I set this up for myself?” Well, I said it was simple, and it is … But of course the words “It’s just a little bit of code on your website” might not make you feel like it is a simple thing to achieve. And unfortunately, if your website is a little long in the tooth or built on a closed website platform it might be a little more difficult. But for a lot of people with up to date websites it will be a very easy thing to do, especially if their site is built on WordPress. The full instructions on how to set up twitter cards can be found on Twitter’s developer website here. If you can’t make head nor tail of it, give us a shout and we can advise what twitter cards would be best suited to you and either help you set them up, or just set them up for you.